338 pages | 20 B/W Illus. This book examines the law reforms of contemporary China in light of the Party-state’s ideological transformation and the political economy that shapes these reforms. This involves analysing three interrelated domains: law reform, power and wealth. 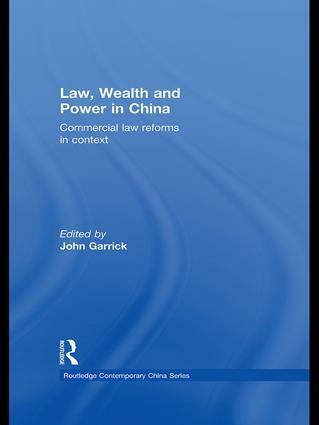 The contributors to this volume employ a variety of perspectives and analytical techniques in their discussion of key themes including: commercial law reform and its governance of wealth and regulation of economic activity; the influence and authority of the Party-state over China’s economic activity; and the influence of wealth and the wealthy in economic governance and legal reform. Utilizing an interdisciplinary approach, this book presents analytical perspectives of new work, or new lines of thinking about the new wealth, power and law reforms of China. As such, critical boundaries are explored between legal and financial reforms and what these reforms signify about deeper ideological, economic, social and cultural transformations in China. The book concludes by asking whether there is a ‘China model’ of development which will produce a unique variety of capitalism and indigenous variant of rule of law, and examining the ‘winners and losers’ in the transition from a centrally planned economy to a market economy. Law, Wealth and Power in China will be of interest to students and academics of comparative law, Asian law, Chinese economics and politics, Chinese Studies, as well as professionals in investment banking, finance and government. John Garrick is a solicitor and senior research fellow at Macquarie University’s Graduate School of Management (MGSM). He is the author and co-editor of a wide range of scholarly publications including several well known Routledge books on power relations and has worked extensively in both legal practice and academia in Hong Kong, the Middle-East, North America and Australia.